The Chariot portrays the figure of the inner-self; at rest, yet poised for action. 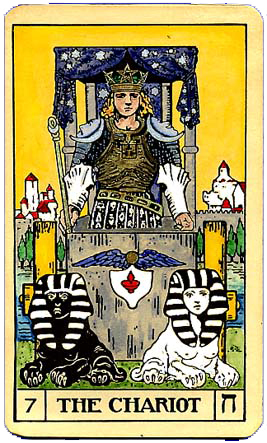 Symbolic of the conquest over illusion, The Chariot teaches us the defining quality of speech; how self-talk creates our reality. Universal forces provide protection while tenacity assures victory and triumph. Ruled by the Moon, it represents the cyclic aspect of change and is associated with psychic receptivity. The Chariot image on journals, T-shirts, and mugs. Affirm: I Am that which I desire.